Last edited by MKSheppard on 2005-01-31 04:37pm, edited 4 times in total. Last edited by MKSheppard on 2004-12-20 03:59am, edited 1 time in total. All of the 14" gunned BBs have been retired or regunned to 16". and we have12,000 ton to 15,000 ton heavy cruisers as common place. (New Mexico and Tennesee classes refitted to carry 16"
3 Old 14" BBs in reserve. for a total of 45 Capital Ships. 3 squadrons, 45 B-29, 60 crews, 11 men per crew, 2,078 officers and men in group. 4 squadrons, 72 aircraft (B-17/24), 96 crews, 9 to 11 men per crew, 2,261 officers and men in group. 4 squadrons, 96 aircraft (B-25/26), 96 crews, 5 to 6 men per crew, 1,759 officers and men in group. 4 squadrons, 96 aircraft (A-20/26), 96 crews, 3 to 4 men per crew, 1,304 officers and men in group. 3 squadrons, 108-126 aircraft (P-40/47/51), 108-126 pilots, 994 officers and men in group. 3 squadrons, 108-126 aircraft (P-38), 108-126 pilots, 1,081 officers and men in group. 4 squadrons, 80-110 aircraft (C-47), 128 crews, 4 to 5 men per crew, 1,837 men in group. 4 squadrons, 125 aircraft (C-46/47), 150 crews, 4 men per crew, 883 men in group. 18 aircraft (P-61/70), 16 crews, 2 to 3 men per crew, 288 officers and men in squadron. 27 aircraft (various including F-6), 23 pilots, 233 men in squadron. 24 aircraft (F-5), 21 pilots, 347 men in squadron. 18 aircraft (F-7/9), 16 crews, 9 men per crew, 474 officers and men in squadron. Squadron Complement: 67 Officers, 360 E.M.
Group HQ: 25 Officers, 57 E.M., 1 W.O. Total Group: 293 Officers, 1497 E.M., 1 W.O. Squadron Complement: 67 Officers, 310 E.M.
Total Group: 293 Officers, 1287 E.M., 1 W.O. Squadron Complement: 39 Officers, 245 E.M.
Group HQ: 27 Officers, 70 E.M., 1 W.O. Total Group: 144 Officers, 805 E.M., 1 W.O. Squadron Complement: 39 Officers, 274 E.M.
Total Group: 144 Officers, 892 E.M., 1 W.O. T-1: Breech loading rifle, black powder vintage. elements and if they cooked off, goodbye hands. more rapid production, and cheapness. the field, etc, developed to replace the T-4, to avoid Royalty payments to MauserWerke. power, but 40% cheaper to manufacture. for no loss to themselves. cost and time needed to manufacture it. to the poor range of the 5mm cartridge. a cyclic rate of 1,000 RPM, versus the 870 of the K1924. Same as LMG version, but on heavier tripod mount, allowing greater accuracy. Fires a 13mm round at a cyclic rate of 400 RPM, replaced the older K1914 HMG. Marina wrote: No USS Quebec City? the defenders surrendered without firing a shot. Last edited by MKSheppard on 2004-12-20 10:38pm, edited 1 time in total. *50.3 sq.mi. of Cape Town (40% of the built-up area) had been burned or bombed to ashes. *4,500,000 people who had lived in the area were now homeless. "We have destroyed all the target areas we have set out to destroy." at Windhoek—in which 450 planes dropped 3,200 tons of mixed inciendaries and bombs. Port Elizabeth, which caught another 3,000-ton load of U.S. bombs. had been stepped up 100% in two months, and would soon be further increased. will be no lightening of the bomb loads. NUMBERS AS OF 1941: 87, equipping 1 Heavy Bomb Group in CONUS. seats, along with the gunner's compartment. Self sealing fuel tanks were also added. NUMBERS AS OF 1941: 82 produced; equipping 1 Heavy Bomb Group in CONUS. NOTES: A dorsal power-operated turret with twin .50 MGs was added. NOTES: First mass production B-25. Was widely supplied through lend-lease. NOTE: B-25C Mitchells built by North American's Kansas City plant. 303 mph at 25,000 ft, cruise at 200 mph. NUMBERS AS OF 1941: 18 produced, with 156 ordered. NOTE: Was a B-26B built in Omaha, Nebraska at a new plant for it. NOTE: Experimental version built to test VDT engine (Turbocompounding). by a shorter solid nose housing a 75mm M4 cannon and two fixed .50-cal. machine guns. in arriving to the fronts. led to higher breakups if the wing was holed. to 277 mph, and the B-26F did not handle quite as well as previous versions. from the -G model's M4 to the lighter T13E1 75mm cannon. NOTE: The B-29A was the version of the Superfortress built by Boeing at the Navy-owned Renton plant. than specifically Air Corps-type equipment. 364 mph at 25,000 ft, cruise at 210-225 mph. modified to B-29B standard in the field. 393 mph at 25,000 feet, 402 mph at 30,000 feet, cruise at 235 mph. 5,000 miles with 10,000 pounds of bombs. 2 x 20mm in tail. NOTE: Cancelled VDT (Turbocompound) version. the USAAF to replace B-25C and D models lost through attrition and combat losses. depending on which Block J was modified with the enclosed nose. 430 mph at 25,000 feet, 415 mph at 30,000 feet, cruise at 233 mph. 375 mph at 41,600 feet. Cruising speed 248 mph. 1946, by adding jet pods and removing the gun turrets. 469 mph at 42,120 feet, crusing speed, 250 mph. 72-gallon drop tank hardpoint was provided. points were provided for six 20-pound bombs. shortly after the US Declaration of War. to 200, with the only differences being various radio fits, propellor fits, and improved engines. No real notable improvements over the P-39Bs. protection was provided for the pilot. different loads to be carried under the wings, instead of being limited to a single belly hardpoint. a 500 lb bomb under the fuselage. Most of the production went to foreign countries. NOTE: This block run added the bubble canopy, dramatically increasing the pilot's field of vision. as well as a more powerful engine. NOTE: Identical to P-38J except for armament. ailerons and squared off wingtips which improved roll rate and manuverability. also a new bubble canopy was added, increasing visibility. pre-attack recon for OPERATION BIG STICK. NOTES: Built from B-36C blueprints as dedicated recon aircraft. 4 x .30 MGs, 1 x .30 MG firing rearwards, 10 x 30 lb bombs internally, or 4 x 100 lb bombs externally. sold off to foreign customers. 4 x .30 MGs, 1 x .30 MG firing rearwards, 20 x 17-30 lb bombs internally, or 4 x 100 lb bombs externally. sold to foreign customers or sent to mechanics' schools. up in mechanics' schools. The last A-17A was stricken from the US inventory on October 31, 1943. Single 1,100 lb bomb or similar weight of smaller bombs. removed for low altitude ground attack duties. four to six .50 MGs. 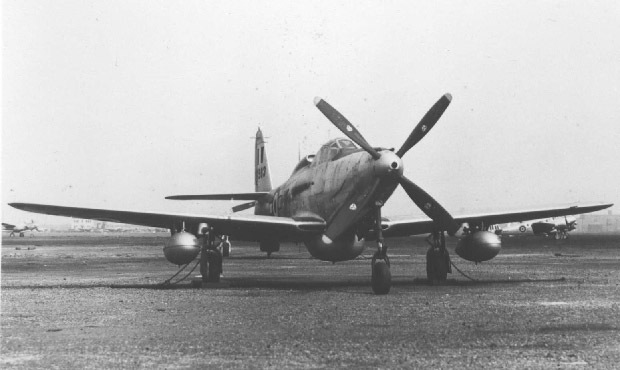 Most of the production run (some 700 aircraft) was sent to the Soviet Union under lend-lease. the bomb bay externally, due to requests from the VVS. were provided to other countries under Lend-Lease. NOTES: The A-20G was identical to the A-20F, with the exception of being powered by the 1700 hp R-2600-29. pounds for the A-20C to 24,170 pounds for the A-20G. A-20J and A-20G production lines ran in parallel with at a ratio of about 1 -J model for every 6 -G models built. 16 machineguns to be fired forward; and both turrets were remotely operated. it also signaled the -B's in formation to drop their bombs. complex and expensive attack aircraft the Army Air Forces were acquiring. major A-24 Invader variants, and the engines were improved R-2800s, with 100 more hp each. on both sides of the fuselage. NOTES: Basically a scaled-up DC-4 / C-54.